A superb ensemble cast falls in for action in Stanley Kubrick's brilliant saga about the Vietnam War and the dehumanizing process that turns people into trained killers. Joker, Animal Mother, Gomer, Eightball, Cowboy and more - all are plunged into a boot-camp hell pitbulled by a leatherlung D.I. (Lee Ermey) who views the would-be devil dogs as grunts, maggots or something less. The action is savage, the story unsparing, the dialogue spiked with scathing humor. Full Metal Jacket, from its rigors of basic training to its nightmare of combat in Hue City, scores a cinematic direct hit. $2.217 million on 215 screens. As I reviewed 1987’s Full Metal Jacket, I did so within the context of a full-blown examination of much of Stanley Kubrick’s work. I’ve watched the new DVD releases of his films in chronological order, so Jacket was the last of the five movies I examined. I had never much cared for most of his flicks, but after a surprisingly positive experience with previously-hated 2001: A Space Odyssey, I kept open the thought that perhaps I’d now enjoy Jacket. Would I still dislike it after all these years? Short answer: yes. Actually, the long answer's also "yes”. I originally watched Jacket during its theatrical run. If I recall correctly, I thought it lacked any real reason to exist. The first half was generally regarded as the best part, and Lee Ermey built his career around the "ultimate drill sergeant" act seen here. Unfortunately, I didn't think much of those scenes, and the rest of the film was even less interesting. Jacket didn't seem to offer anything we hadn't already seen in 8000 other Vietnam movies, and I thought most of its predecessors did it better. While I've clearly modified my opinion of 2001, all my original criticisms of Jacket remain. In reality, my only substantial original problem with it stemmed from my feeling that it offered nothing new, and that was definitely still the case. I had multiple instances of déjà vu throughout this film. 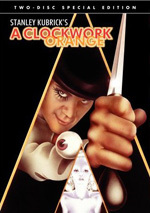 Unfortunately, my recent experiences with Kubrick via pictures like 2001 and A Clockwork Orange showed that something else was missing from Jacket: the superb restraint and subtlety he showed in those movies. Jacket splits unevenly between the first 40 percent or so of the film - which introduces our main character, Joker (Matthew Modine) in boot camp - and the rest of the piece, which shows Joker's experiences in Vietnam. The first segment generally received the most praise, and I agree that it was more interesting than the remainder of the picture. That didn't make it very good, however. As far as the "déjà vu" part goes, the first section of Jacket elicits a few memories of An Officer and a Gentleman, but to be frank, the movie it most resembled was Stripes. Essentially the boot camp part of the movie was a more intense and brutal version of that comedy classic. Even the film's opening shot, in which all the new recruits received their severe military buzzcuts, directly quoted the Bill Murray flick. Since I've never been in the military, I can't say this for sure, but I think that in an odd way, Stripes probably presented the more realistic picture of training camp. Kubrick's offering was so harsh and negative that it almost completely destroyed any view of the real world. I have no doubt that Marine boot camp would be tremendously unenjoyable, but there has to be some semblance of humanity on display there. Not if we're to believe Kubrick, however. Only Joker occasionally showed glimmers of sympathy for pathetic Gomer (Vincent D'Onofrio), the sub-Gump loser who couldn't hack it until he went psycho. That brings me to the other main flaw of Jacket: the way that Kubrick virtually beat the viewer over the head with his concepts. All the "blank slate" ideas from 2001 and Clockwork flew out the window here. Kubrick clearly wanted us to see that the military creates killers by stomping the humanity out of them. It's all rather absurd, to be honest. One minute Gomer's a moronic screw-up who wants to succeed but is just too stupid to do so. Once he goes around the bend psychologically, however, Gomer all of a sudden gains about 30 IQ points and becomes one bitchin' Marine! Of course, this comes at a cost: Gomer becomes both suicidal and homicidal, which is always a nice pair. Pretty subtle there, Stanley - I hope I didn't miss your point. As if Kubrick's ham-handed handling wasn't bad enough, D'Onofrio offered an exceedingly bad performance as Gomer. As a pleasant simpleton, his inspiration seemed to come from Disney’s Goofy; I truly expected him to say "Gawrsh!" from time to time. 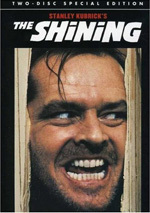 D’Onofrio appeared to use another Kubrick work to provide a model for psycho Gomer: Jack Nicholson from The Shining. I think D'Onofrio watched the "Here's Johnny!" scene over and over and took it from there. I know I was supposed to be scared or spooked, but to be honest, when he leered at Joker and rolled his eyes back in his head, I found it tough not to laugh. D'Onofrio was so over the top that the sequence became unintentionally comic. After all that, you'd think the Vietnam scenes would be an improvement, but they're not. Once again, the pilfering of inspirations from other films continues. One segment showed the grunts as they were interviewed for TV, and it reminded me an awful lot of those M*A*S*H episodes in which journalists visited the 4077th. Frankly, it was sad to watch such an influential director steal so much for his own film. Kubrick's lack of subtlety continued during the Vietnam part of Jacket. Once again, he told us what to think and never allowed us to draw our own conclusions. War is hell - thanks Stan, I didn't know that! Joker remained the most sympathetic character, and he was obviously supposed to be the audience's entry into the story. Unfortunately, Modine was pretty flat throughout the picture. They dressed him up as John Lennon - find a still from his appearance in How I Won the War and you'll see what I mean - and made him a pseudo-peacenik to keep the brutality of the other Marines from becoming overwhelming. Actually, that touch wasn't needed, because the horror of war never really came through in Jacket. Since Kubrick couldn't find an original way to depict the battle, it all seemed like a summer rerun, and it lacked the impact of previous war films. I never felt involved in the story or had any interest in the happenings. The film tried to startle and shock us, but it failed and it essentially limped along until its conclusion. Is Full Metal Jacket the worst movie ever made? No, not by a long shot. For all its faults, it remains a competently executed war film. However, it may well be Kubrick's worst picture, and that is why many others and I have treated it harshly. For better or for worse, he was regarded as a master director, and “okay” just wasn't good enough for someone of that stature. 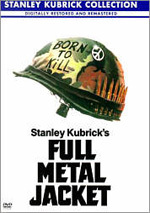 Full Metal Jacket appears in a fullscreen aspect ratio of 1.33:1 on this single-sided, dual-layered DVD; due to those dimensions, the image has not been enhanced for 16X9 televisions. Much stink has been made over the fact that Jacket is not presented in the letterboxed format. Apparently this is because Kubrick preferred it that way. From what I've read, the film was shot full-frame and then matted for the 1.85:1 ratio of the theatrical release, so no information has been lost on the sides, and additional material is visible on the top and bottom. Personally, I prefer that all films - even those shot this way - be letterboxed to preserve the original ratio; I feel that to add material that wasn't there on the screen distorts the movie in a way. Still, this kind of presentation isn't terribly bothersome to me. Of all the old Kubrick DVDs, Jacket was one of the better-looking, though that was faint praise. The original disc presented a good picture except for copious amounts of grain; I thought it was one of the grainiest images I’d ever seen. Happily, the new disc cleaned up that act and it offered a consistently solid picture. Sharpness seemed to be quite positive during the majority of the film. During a few of the boot camp scenes, I thought some wide shots appeared slightly soft. However, this was a very minor complaint, as almost the entire movie was crisp and well-defined. I saw no signs of moiré effects or jagged edges, and print flaws were virtually nonexistent. The grain that marred the original DVD no longer appeared, and almost all print flaws also failed to tarnish the picture; other than a couple of small specks, this was a clean and nicely fresh presentation. Jacket featured a fairly subdued palette for the most part, and the DVD replicated these hues well. Although the colors tended to appear slightly pale at times, these tones made sense within the design of the film and they looked clear and accurate. The Vietnam sequences provided the strongest hues, especially during sunset shots; on those occasions, the golden tones were solid. Black levels appeared nicely deep and dense, and shadow detail was also quite strong. All low-light scenes seemed appropriately dark but never too opaque, and some presented very strong delineation. For example, the sequence during which the other Marines attacked Gomer in bed showed solid and stark lighting that made the piece all the more effective. Ultimately, I was quite impressed with the picture of Full Metal Jacket and thought it offered a consistently solid visual presentation. The Dolby Digital 5.1 soundtrack of Full Metal Jacket also provided significant improvements over the audio heard on the old DVD. Some parts of that disc’s monaural mix seemed to be acceptably clear and rich, but the dialogue was a mess, as most of the speech appeared rough and distorted. Some of those concerns manifested themselves during the new 5.1 track, but to a much smaller degree, and the expansion offered by the soundfield more than compensated for some minor auditory flaws. 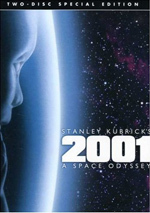 Of the four Kubrick DVDs that feature 5.1 remixes taken from material that was originally monaural, Jacket presented the greatest opportunities for growth. To be certain, A Clockwork Orange, Barry Lyndon, and The Shining all had some moments during which their environments could sparkle, but the content of Jacket was tailor-made for a broader soundfield. Happily, this new track opened the mix and provided a fine auditory setting. During the boot camp scenes, the soundfield generally remained fairly monaural. The music spread quite nicely to all five channels, but effects seemed appropriately constrained to the center for the most part; I heard nice localization when the grunts were on the shooting range, and some general ambience also stretched across the different speakers, but the mix preferred to stay centered. That attitude changed when our characters went to Vietnam. Once we got to a battlefield, the soundscape opened up nicely and provided a lot of appropriately-placed sound. Choppers flew past neatly, and their blades seemed to engulf me when we watched folks on board them. The skirmishes showed a wide range of effects, as gunfire and mortar blasts appeared in logical locations that made the fight come from all around me. While this mix certainly won’t replace that of Saving Private Ryan in the “demo” department, I still thought it presented a very involving and atmospheric track that nicely broadened the original monaural mix. Audio quality demonstrated a few concerns, but these seemed fairly minor. As I already noted, some problems came along with the dialogue. At times, speech seemed constrained and stiff, and a bit of edginess also could be heard. As was the case with the old DVD, Lee Ermey’s lines remained the most significantly flawed of the bunch; they consistently showed signs of brittleness. However, the new track really cleaned up these stems to a substantial degree, and the rampant distortion and static I heard on the old mix have disappeared. Otherwise, the remaining elements sounded quite good. Effects were usually quite clean and realistic, and they showed positive dynamics. A little gunfire seemed slightly distorted, and I felt that explosions displayed minor “boominess”, but for the most part, these aspects of the track were very clean and accurate, and they worked well. Music seemed even better reproduced, as the score was bright and dynamic at all times. I found the music to sound very distinct and rich, and the track provided nice depth as well. I waffled between an “A-“ and a “B+” for this mix, mainly due to the mild edginess to some speech. However, I opted for the higher grade simply because I felt that even with some minor flaws, it still offered a much stronger presentation than would be typical for a movie from 1987. The only department in which the new DVD fails relates to its extras. As was the case with the old one, we find almost nothing on Jacket. All this DVD provides is the same theatrical trailer that appeared on the old one. In the case of Full Metal Jacket, the absence of supplements was a serious drawback for me simply because I didn’t like the movie. I was much better able to forgive the paucity of materials on A Clockwork Orange or Barry Lyndon just because they were much better films. A full special edition would have made this DVD much more interesting for me. Nonetheless, Jacket remains a decent flick, albeit one with little point or flair to distinguish it from others in its genre. The DVD completely trounces the original release with its vastly superior picture and sound. If you’re new to Kubrick, Full Metal Jacket shouldn’t be high on your list, but already-established fans should be pleased with this high quality presentation of the film.